Subscribe to our monthly emails to be reminded about upcoming classes & events. Do you have your CWP, but haven’t done any other training since your CWP class? Do you go to the shooting range and stand still, shooting at a single paper or cardboard target? This course helps take you to the next level as a daily conceal carrier. Prerequisite: Current South Carolina CWP holder (or recently completed CWP course w/ proof of completion) or law enforcement. You must upload a copy of your CWP below during registration. A large portion of this course is held outdoors, so wear weather appropriate attire. 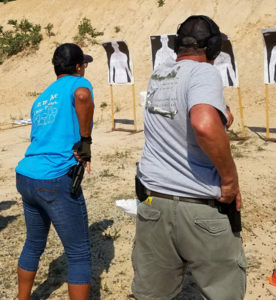 Participants should bring 200 rounds of ammunition for their pistol as well as their own holster appropriate for their concealed carry pistol. STRONG SIDE OR APPENDIX CARRY ONLY FOR THIS COURSE. Eye and ear protection is required to be worn during live fire drills. Electronic hearing protection is recommended to make hearing range commands easier. A ball cap is strongly recommended. Participants will be shooting on the move, and a variety of positions.